I am a huge Marvel fanboy. I have been my whole life. I prefer Marvel to DC, now that doesn't mean I hate DC or I want their entertainment to fail, I just prefer Marvel stories to DC stories. Batman is my favorite superhero ever, yes. But if you were to take a look at the rest of the my favorite superhero top ten, it would be littered with Marvel characters. I like that their stories are more humanistic, their characters more vulnerable, and there is a more realistic tone to their stories, it makes the stakes so much higher on the reader. Since I am such a big Marvel fanboy, does that mean I should love everything they dish out? Does that mean you should expect a eye-watering overly-positive review of all their movies and television shows? Absolutely not, I can't just write off a movie or a TV shows flaws simply because that red Marvel banner fills the screen. In fact, I have been pretty honest about my reactions to their films. My "Avengers: Age of Ultron" and "Iron Man 3" reviews were mixed. I have spoken up about what has worked and hasn't worked with "Agents of S.H.I.E.L.D." I wasn't much of a fan of "Agent Carter." I was also so impossibly disappointed with "Iron Fist" that I never got around to finishing the first season and reviewing it for my site. So yes, Marvel has plenty of sins to answer for, don't get me wrong. Just because I love the property doesn't mean I won't be honest or fair in my write-ups and my opinions. This weekend marked the release of Netflix's "The Defenders." Essentially, its the TV version of "The Avengers." Like we had solo films of most of the core team of Avengers leading up to their big movie together, Netflix had individual solo seasons, introducing us to Daredevil, Jessica Jones, Luke Cage and Iron Fist, with the knowledge that they would meet up in a "The Defenders" mini-series. We have met all four players, and now its time for their big team up to stop a threat no one hero could face on their own. Much like "The Avengers," there is a level of excitement that sets in just seeing Daredevil (Charlie Cox), Jessica Jones (Krysten Ritter) , Luke Cage (Mike Colter) and Iron Fist (Finn Jones) all onscreen together. Not only that, but Colleen Wing (Jessica Henwick), Claire Temple (Rosario Dawson), Stick (Scott Glenn), Misty Knight (Simone Missick), Malcolm (Eka Darville), "Foggy" Nelson (Elden Henson), Jeri Hogarth (Carrie-Ann Moss), Trish Walker (Racheal Taylor), Karen Page (Deborah Ann Woll), Bakuto (Ramon Rodriguez) and Elektra (Elodie Yung), all of whom appeared in one or more of these Netflix series. So we see the world coming together, and just seeing these characters interact and share this world is half the fun. We have spent time with these characters and seeing them come together pays off. The action beats are pretty solid, and after slugging through the painfully mediocre fight scenes in "Iron Fist," these felt like a welcome commodity. The action is downright exciting here. The fight scene in the white business building that was teased in the trailers is pretty spectacular. Its so good, that I was afraid it wasn't going to get topped, but I liked some of the other action bits later in this mini-series. Some critics complain about some of the more comic book aspects of the show. Yes, these Netflix shows have leaned on some realism, despite revolving around superpowered people. By and large, I think the shows and "The Defenders" do a good job of balancing the real factor as well as the more comic book elements of this world. Its a tight rope to walk on, but I think the mini-series keeps it all together for the most part. Maybe I am a little more lenient on those ideas simply because I have been reading comics for so long. Four superhero types teaming together to fight mystical ninjas doesn't seem weird to me. Depending on what you thought of the performances of each lead hero in their respected solo shows will give you an indicator of what you will think of their performances here. I loved Cox as Daredevil, Ritter as Jones, and Colter as Luke Cage. They definitely don't disappoint here. If there was a character you thought was annoying in another show, you may think the same here. I found Finn Jones to be surprisingly annoying as Iron Fist, and he's once again surprisingly annoying here. Especially since I was such a fan of his on "Game of Thrones." I guess that should show that the actors are at least consistent. I feel like everything I have discussed so far is icing on the cake. This is extra stuff that we hope to enjoy every time we sit down to watch a superhero show. Yes, the action scenes are thankfully good. Yes, the performances are there. Yes, they got the wow factor of these characters together in one place. The next piece of this puzzle is, can the show generate a storyline where we care what happens to these characters? How far can they take this story of evil mystical ninja's? Well, the answer to that question seems to be not much. First and foremost, our heroes take four episodes to finally get together. In the first four episodes, its mostly filler of catching up with each hero and getting to know where they are right now. That may help for those who haven't seen any or all of the Netflix Marvel shows so far, but it kinda slows the momentum of this mini-series by doing so. Plus, what each hero is doing is so boring that's its hard to get into what they are doing. If this was a thirteen episode run, like all the solo shows have been, then this may not have been a problem. But with eight episodes, it seems like everything is pushed fast at the end. One negative a show falls into is circular plots, things that have happened already in a previous season. It seems like in "The Defenders," there is a circular plot every few episodes. Iron Fist can't stop talking about how he failed Kun L'un, Daredevil can't stop talking about how he failed Elektra, Luke Cage is trying to adjust to life after prison, and Jessica Jones is getting over killing Kilgrave. But over eight episodes, it feels like these conversations are happening over and over and over and over and over again. So often that I can't help but find it distracting. 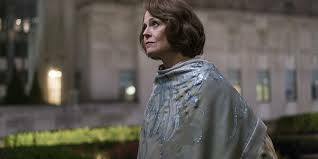 Possibly the biggest sin "The Defenders" commits is totally wasting Sigourney Weaver. I mean its freaking Sigourney Weaver, playing the villain of this mini-series and she is totally wasted. She plays Alexandra, not introduced in any previous shows. She's the leader of The Hand, this band of mystical ninjas who we met in "Daredevil" and "Iron Fist." While I think Weaver does good work here, she's barely used and the treatment of the character, was just so sad. We barely get to know her as a character or feel the intimidation of her villain before she's prematurely killed two episodes for the end of the mini-series. If you got a big name like Weaver and she's playing a villain, give her something to do! I don't know if this was a result of having limited episodes. I mean, the assembling of the team seems rushed, since they meet in episode four then spend the next few trying to trust each other, they pretty much assemble then the show is over. They team up then leave before we get to know them. I could say the same about Weaver's villain. The acting is great, the action scenes are so cool that they will make you swoon. But there is a rushed quality to lots of the mini-series. "The Defenders" is good TV. It's fun TV. But I think if there was enough time, effort, and skill given to this mini-series, it could have been great TV. I hope if they make another Defenders series, they get right to the story, and that they don't waste their villains. I was hoping to love this mini-series, I really did. But "The Defenders" ends up being a mixed bag. There is plenty of good stuff, but its mostly left with moments full of potential more than anything. I am still excited for Netflix Marvel, but I am hoping this next phase of TV, they improve on their mistakes and I hope the next time this foursome meets, its more exciting. "Daredevil" and "Jessica Jones" are still the top tier Netflix Marvel shows. "The Defenders" was fun, but very slight.